So I guess this is the artwork thats going to wrap up 2008 for me here on Deviant! Hope you all have a Merry Xmas and a Happy New Year! I wish you all the very best! Very nice. First saw this in a mod for the WarCraft 3 menus. I would love to see you give this an update. Oh my gosh I was just stalking your folders looking through all your art and was so surprised to see this here! I see this picture EVERYWHERE. Have you drawn hatsune miku? I see this picture literally everywhere. I hope you get credit for it.. 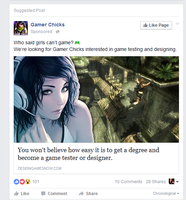 I've seen this picture used for an ad for Designgamesnow.com to get girl gamer testers and designers. Not sure if you gave them permission. I am trying to launch a new product onto the market and came across this image on a different website, tracked it down to here (must say this image is everywhere!!). How does one go about contacting the owner to ask for permission to use his/her image? Sorry very new to this site. This piece is being used in a piece of advertisement on Facebook. Thought I'd let you know. She's so beautiful ! you've done a wonderful worl! She is beautiful.. Well done. God this came all the way from 2008? And it's still casually sitting here in my browse section... Which never changes. I know right? I was ohhhh it's this person ! This is a MASTERPIECE! X3 Um...Is it okay if I use it as a cover for this Wattpad story I'm making? Kate Bush Circa 1978/9 I reckon. Well, that's what I saw when I first glanced past it. Excellent. Fantastic job. She looks absolutely beautiful.